The mission of the 3rd Brigade Combat Team, 1st Cavalry Division, "Greywolf, " is to, on order, deploy to a contingency area of operations, prepare for and on order execute full spectrum operations in order to achieve US national objectives. It would then, on order redeploy and prepare for future operation. The 3rd Brigade Combat Team, 1st Cavalry Division was first constituted on 29 August 1917 in the Regular Army as Headquarters, 3d Cavalry Brigade. It was organized in December 1917 at Camp Harry J. Jones, Arizona as an element of the 15th Cavalry Division. The Brigade was relieved on 12 May 1918 from assignment to the 15th Cavalry Division and demobilized on 15 July 1919. The unit was reconstituted on 20 August 1921 in the Regular Army as Headquarters, 3rd Cavalry Brigade, and was assigned to the 2nd Cavalry Division. The Brigade existed only on paper until it was activated on 15 October 1940 at Fort Riley, Kansas. The unit was relieved on 15 July 1942 from assignment to the 2d Cavalry Division and was concurrently converted and redesignated as Headquarters, 9th Armored Division Trains. The unit subsequently deployed to the European Theater where it received campaign participation credit for the operations in Rhineland, Ardennes-Alsace, and Central Europe. The unit was awarded 2 Meritorious Unit Commendations with streamers embroidered Europe 1944 and Europe 1945. Following World War II, the unit returned to the United States and was inactivated on 13 October 1945 at Camp Patrick Henry, Virginia. On 15 July 1963 the unit was relieved from assignment to the 9th Armored Division, and concurrently converted and redesignated as Headquarters, 3rd Brigade, 1st Cavalry Division. The Brigade was activated on 1 September 1963 in Korea, with the 1st Cavalry Division. There it served on station at the Demilitarized Zone. In July 1965, the Division moved to Fort Benning, Georgia and underwent reorganization as an airmobile unit. This was as part of the reflagging of the 11th Air Assault Division (Test) as the 1st Cavalry Division (Airmobile). The Brigade sailed from Charleston, South Carolina to Quo Nhon, Republic of Vietnam on 17 September 1965. The first major action undertaken by the Brigade began on 10 October 1965. This was followed by participation in the Ia Drang Valley operation known as the Pleiku Campaign. For its exceptional performance in the campaign, the Brigade shared with the Division, the Presidential Unit Citation. With the drawdown of US forces in Vietnam, the 3rd Brigade was formed into a separate unit, 3rd Brigade (Special), 1st Cavalry Division, and assumed operational control of the old 1st Cavalry Division area of operations until 10 April 1971. All told, the 3rd Brigade participated in 16 campaigns in Vietnam: Defense, Counteroffensive, Counteroffensive Phase II, Counteroffensive Phase III, Tet Counteroffensive, Counteroffensive Phase IV, Counteroffensive Phase V, Counteroffensive Phase VI, Tet 69/Counteroffensive, Summer-Fall 1969, Winter-Spring 1970, Sanctuary Counteroffensive, Counteroffensive Phase VII, Consolidation I, Consolidation II, and Cease-Fire. Finally in 1972, the Brigade left Vietnam for Fort Hood, Texas, to rejoin the rest of the 1st Cavalry Division. When its colors arrived at Fort Hood on 29 June 1972, the unit officially became the "Greywolf" Brigade, an homage to General George Crook, considered our nations greatest Indian Fighter. The Brigade subsequently underwent a change from its airmobile configuration to an Infantry Heavy Brigade. The Greywolf Brigade remained with the 1st Cavalry Division until its inactivation on 15 September 1980 at Fort Hood, Texas. It remained on the inactive roles until 21 May 1991, when the 1st Brigade, 2nd Armored Division was reflagged as the 3rd "Greywolf" Brigade, 1st Cavalry Division, which was subsequently reactivated at Fort Hood, Texas. After returning to the active rolls, the Brigade participated in several National Training Center rotations, deployed Task Force sized elements to Kuwait, and in September 1996, conducted the first post-Desert Storm, no-notice, brigade sized deployment to Kuwait in support of Operation Desert Strike. In support of Operation Iraqi Freedom II, the Brigade returned to the Middle East in 2004 to the capital city of Baghdad with responsibility for the security of the "International Zone" (also known as the "Green Zone"). The Brigade conducted combat operations in the violent Haifa Street neighborhood during the beginning of the insurgency in Iraq, setting the security conditions to conduct the first free national Iraqi elections within that critical area. 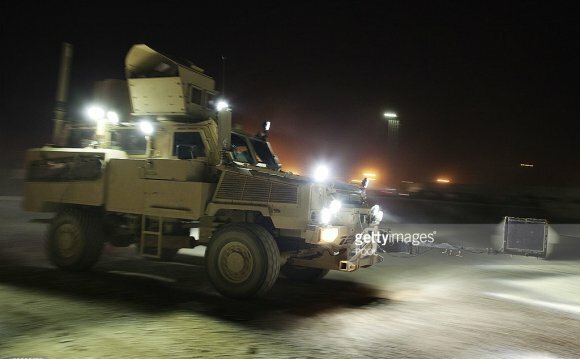 The 3rd Brigade Combat Team ("Grey Wolf") is a combined arms armored Brigade of the 1st Cavalry Division. Its major equipment includes M1A2SEP Tanks, M2A3 & M3A3 Bradley Infantry Fighting Vehicles, M109A6 Paladin Howitzers, and M1114 Up-armored Humvees.